As well its beaches, temples and vibrant up-and-coming cities, India is also famous right around the world for its cuisine. Above all, it is the country’s curries that get many a tourist’s mouth-watering before they even touch down on Indian soil, with each region, and even each town and city, having its own speciality dish. Given the size of the country, it’s no surprise that its curries vary significantly in terms of ingredients, taste and spiciness, but if it’s hotness that you’re after, give the following dishes a go. Well-known among British curry lovers, vindaloo actually has Portuguese roots, having been developed in Goa out of an old preserve used by colonial settlers and travellers to keep meat fresh. While the exact ingredients may vary – indeed, British-Indian dishes can often be much different to those which are found in India – a vindaloo should always contain dried red hot chilli peppers, which give it its distinctive kick, as well as garlic and coconut. Alongside chicken vindaloo, restaurants right across Goa serve pork, lamb, prawn and vegetable versions of the famous dish, with prices in local establishments far cheaper than in the UK. As well as being the birthplace of vindaloo, Goa is also home to some of India’s best-loved beaches, with its golden sands and warm waters attracting everyone from backpackers enjoying cheap Goa holidays right through to high-end travellers staying in luxury lodges. The Madras dish was famously developed during the British Raj, combining traditional Indian recipes with English tastes to create a curry that is now enjoyed the world over. While restaurants across the Tamil Nadu of India may serve chicken, lamb or occasionally vegetable versions of this curry, all varieties will have a distinctive combination of fresh and dried chilli peppers at their base. 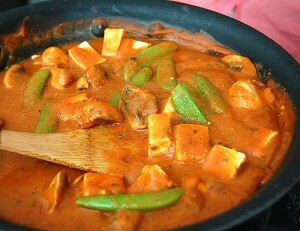 Now known as Chennai, the city which gave the curry its name is renowned for much more than its cuisine. Indeed, it is widely regarded as the cultural capital of the south of India, with dozens of museums and sites of historic interest, including the Kapaleeswarar Temple and the Santhome Basilica. Furthermore, tourists keen to head out for an evening are also able to take in a performance of traditional Natyam dancing before settling down for a red-hot Madras. Highlighting the truly international nature of Indian cuisine, Kozi Kari is a dish that grew out of a fusion of local recipes and those brought to the Kerala region by Jewish settlers many years ago. Like most spicy Indian dishes, it has as its base a mixture of fresh chilli peppers and dried chilli, complemented by ginger, garlic, coconut milk and onions and usually served with chicken, or, occasionally, vegetables. Given the colourful history of the southern Indian state of Kerala, the hybrid nature of Kozi Kari is fitting. Here, as well as the mountains of the Munnar region, you’ll find pristine beaches dotted along the coastline of the Arabian Sea, as well as countless sites of religious and historical significance, including mosques, churches, Hindu temples and, of course, Jewish synagogues. Arguably, it is the Malabar region that offers the best examples of Keralan cuisine, with a wide range of herbs and spices being grown here. Just remember, it’s much hotter in India than the UK, so you’ll be sweating even before you tuck into a spicy curry! Click here for more information on where to stay in Goa, the home of the vindaloo.